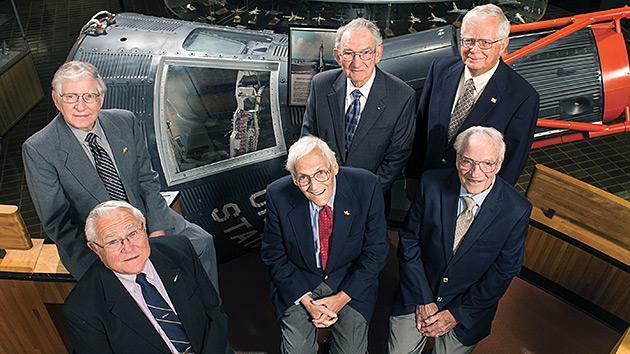 Former Mercury Project engineers, clockwise from top left, Jerry Roberts, Norm Beckel, Dean Purdy, Ray Tucker, Bob Schepp and Earl Robb, in the Prologue Room in St. Louis. Norm spent four years in the U.S. Navy working in electronics before earning his BSEE in engineering from Penn State U, then he joined the McDonnell Aircraft Company in St Louis, Mo. He ended up working in astronautics, specifically developing and testing the communications system and associated test equipment on NASA’s Mercury program. He was on hand for some of America’s earliest Redstone launches, on the ground floor in the blockhouse alongside Wernher von Braun, Kurt Debus, and the nation’s Mercury astronauts. He was also involved in the Atlas launches, including John Glenn’s historic first orbital flight, which relied heavily on good communications. Norm reprised his role with the Gemini program. Earl Robb: Earl joined MacDonnell in August 1952 and joined the Mechanical Design Engineering team where he worked on jet airplane design including several fighter and fighter bomber aircraft. Then he moved to the manned space program when the space age dawned. On Mercury, Earl helped finalize the design configuration for the spacecraft, and when McDonnell won the bid to build it he worked directly on its structural design, specifically its skins, shingles, hatches, windows, and heat shields. He then transferred to the Gemini program where he again led the structural and mechanical design team for the Gemini Launch Adapter, the interface with the Titan II Booster, and also the development of elements needed to support an astronaut during an EVA. Jerry Roberts: Jerry joined McDonnell in 1959 and was assigned to the group working on design definition, procurement, test evaluation and system integration for the Automatic Stabilization and Control System. He reprised the role on Gemini, helping develop the Gemini Guidance Control System. And he was also on hand for launches at the Cape, part of a small group of engineers working in the blockhouse. During missions, he was the go-to “instant knowledge guy: for all things ASCS related. Bob Schepp: As a McDonnell employee, Bob worked launch operations for both man and monkey (well, chimp, really) missions as part of America’s first space program. He did autopilot check out during the launch countdowns on Redstone suborbital flight and Atlas orbital launches. Then he transferred to the Gemini program where he worked on designing the “Orbital Maneuvering System” on board Gemini that would allow it to dock with the Agena target vehicle. He also worked with power, helping develop the fuel cells and power and sequential systems functions that supported launches. And he worked all the even-numbered Gemini missions, including Ed White’s spacewalk! Dean (Wilbur) Purdy: Joined MacDonnell in September of 1955 where he worked on a Mach 2 jet fighter program and three missile programs before working on space. After McDonnell won the bid to build the Mercury spacecraft he worked on the electrical system, eventually heading up the electrical group and helped design the interior of both the Mercury and Gemini spacecraft. He also worked on fuel cells, helping develop redundancy in wiring system and testing prior to the spacecraft’s shipment to the cape. And, he worked on Gemini’s little-known militarized half-brother, the Manned Orbiting Laboratory.